Futaba District is located within the Pacific Ocean coastal area of Fukushima Prefecture called Hamadori. The district is composed of the six towns of Hirono, Naraha, Tomioka, Okuma,Futaba and Namie along with the two villages of Kawauchi and Katsurao. Facing the Pacific Ocean and blessed with a mild climate, the district’s primary industries were fishing and farming. The district has also established itself as Japan’s primary energy supplier. It was the northern end of the Joban Coalfield during the pre-WWII period, and it became the host to a number of Tokyo Electric Power Company’s (TEPCO) electric power plants in the post-war period. In the wake of the Great East Japan Earthquake and the nuclear accident at TEPCO Fukushima Daiichi Nuclear Power Station on March 11, 2011, all the municipalities temporarily evacuated the Futaba District. 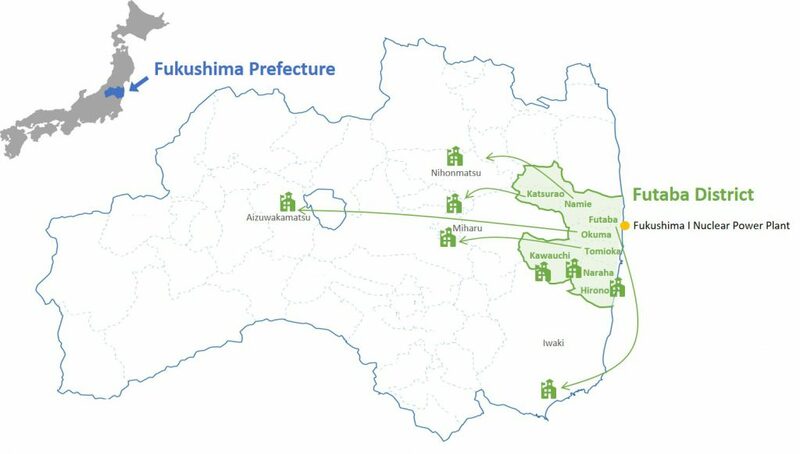 As a result, many civilians faced dramatic changes in their daily lives, such as moving to evacuation sites outside of Fukushima Prefecture. This led to some children missing school and/or transferring schools every time their family relocated evacuation sites.